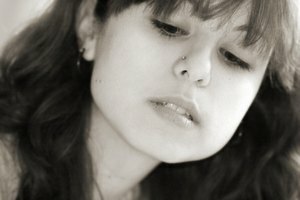 Nose piercings often fall prey to infections, mostly because of poor cleaning and maintenance. Because a nose piercing is on the face (which is an exposed area), it must be carefully cleaned and watched for signs of infection. Many piercers provide important information to their customers on keeping piercings clean, but if you didn't get any advice (or can't remember it), you still need to make sure you maintain your piercing properly. Do not remove your piercing for at least four months after you have it done. Nose piercings can close remarkably fast. In fact, if you remove the piercing in the first four weeks, it could even close up within 24 hours. If your nose stud or ring falls out and you can't get it back in, see a professional piercer as soon as possible. Clean your piercing every day. Dissolve a teaspoon of salt in a small glass of warm water, then dip a cotton ball, tissue, or q-tip into the salt water and use it to clean your piercing thoroughly. Clean all around the piercing on both sides. Then pat dry gently with a tissue. Don't pick at your nose ring or touch it excessively. Contact with your hands increases the chances that your nose piercing will become infected, so wash your hands before touching the stud or ring. Take care not to get any makeup, lotion, or facial care products in your piercing while it's healing. If you do, wash the nose ring gently with salt water. If you have a stud, rotate it one full turn each night before you go to bed. Do this for the first month after you get your piercing. Nose piercings heal more slowly than ear piercings, so don't be alarmed if your piercing still looks red a week or so after you get it done. However, never hesitate to go to a piercing professional or a doctor if you feel you may have an infection.